When choosing a new kitchen faucet, there are many features to consider, from handle styles to spout options. Perhaps the most important consideration, however, is mounting style. When purchasing a faucet, homeowners need to make sure that their preferred mounting style is compatible with their sink's layout. Before searching for a new faucet, homeowners have to inspect their sink. Each sink has a specific number of mounting holes. When it comes to kitchen sinks, most come equipped with one to four mounting holes. The more holes the sink has, the more faucet features they can accommodate. Ahead, learn more about the various mounting hole configurations. When sinks have one mounting hole, they are outfitted with one-handle faucets. Two hole faucets come in several configurations. Some of them have the same basic structure as single hole faucets, and the second hole is used for an additional feature, like a soap dispenser. Other two hole faucets use a stylish bridge structure. 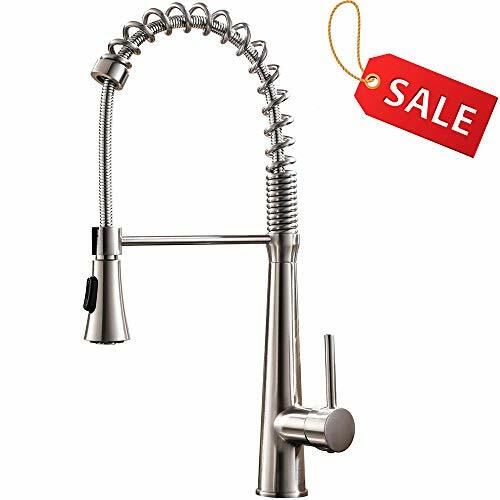 Many kitchen sinks are equipped with three hole faucets; the faucet is installed in the middle hole, and the two handles are installed on the outer holes. While this layout is standard, three-hole configurations can sometimes accommodate additional sink features. For example, pull-out sprayers do not require an extra hole, and they're often used with three hole faucets. Four-hole faucets are also very popular, as they allow for greater versatility than the other options. The faucet uses one hole, the handles use two, and an additional feature is installed in the fourth hole. These features range from dispensers to sprayers to air gaps. Four-hole faucets are not just the most versatile option; they're also available in a wide variety of styles and finishes. Buyers can opt for modern gooseneck faucets, which have a high-arc perfect for filling large pots. Shepherd's crook faucets imbue any kitchen with classic style, and straight spouts have an impressive reach. Pull-out and pull-down faucets are also popular, as they make cleaning and cooking easier. Buyers can find four hole faucets in a wide array of finishes and materials. Popular materials include stainless steel and brass, and popular finishes range from nickel to bronze to chrome. Four hole faucets come with a variety of additional features. They may have a spray/stream selector, which allows users to switch between modes. Pullout spouts are a useful combination of spray and spout functions. Side sprayers are another common addition. When choosing a faucet for a new or existing sink, it's important to choose a faucet that complements the size of the sink. This isn't just a matter of style; if homeowners choose a large faucet for a shallow sink, water will splash out of the sink and onto the counter. On the other hand, if the faucet is too small for the sink, the limited reach of the water will make it hard to clean sink corners. Sinks equipped with four holes are rarely small, and homeowners with this sink structure should be careful to select appropriately sized faucets.